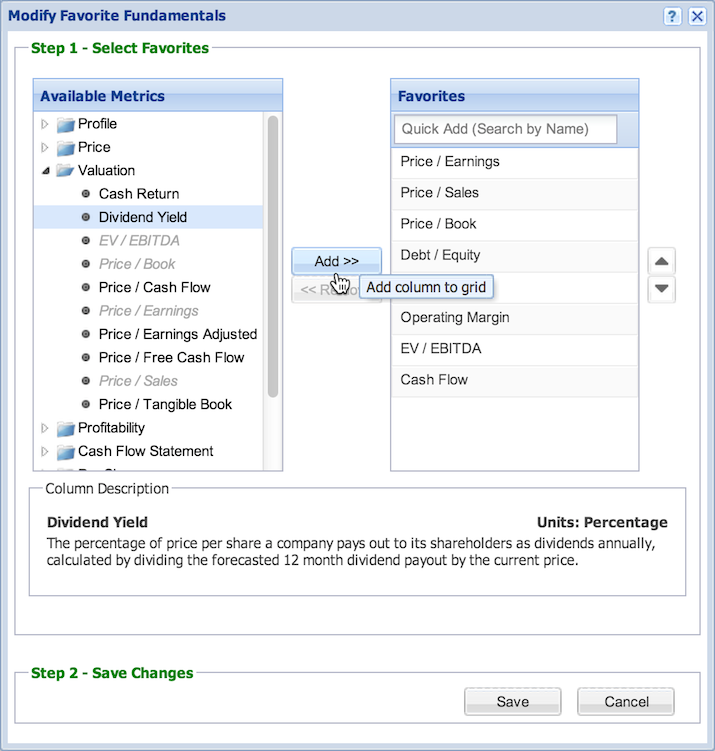 To chart fundamental data, such as the Price/Earnings ratio or Operating Margin, click on the ‘Fundamentals’ button at the top of the chart panel. From the menu that appears, you can search for one of the 100+ chartable metrics to chart, chart a metric from your Favorites list, or chart a metric package, which allows you to chart more than one fundamental metric at once. The fundamental data for the charted tickers will appear in a smaller chart below the main chart. Note: Basic users can only choose from a set list of six fundamentals. You can save up to ten metrics in your ‘Favorites’ list. To do so, click the ‘Customize’ link (shown above) and you will see the following dialog window. 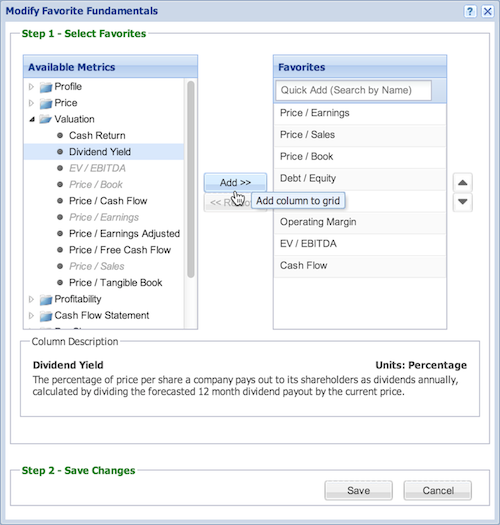 Browse through the folders of metrics on the left or search with the Quick Add search box on the right to add a metric to your Favorites list.. To remove any stocks from the Favorites list, highlight from the right and click ‘Remove.’ Click ‘Save’ when you are done. 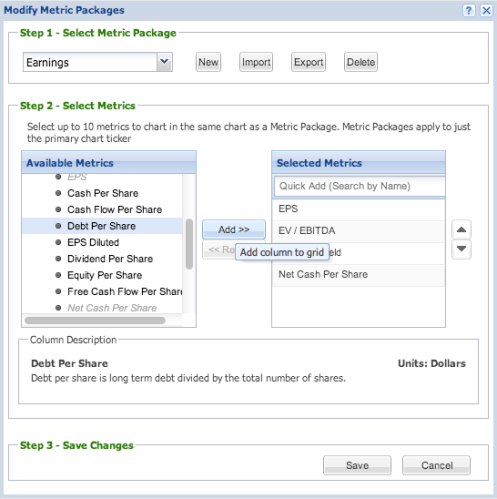 While you can only chart one fundamental at a time if you select from the Favorites list, you can use the metric packages feature to create groups of fundamental metrics that will be charted together. To modify the metric packages, or to create your own, click the ‘Customize’ link in the menu. This will bring up the following dialog box. In Step 1 you can choose the metric package to modify from the drop-down list, or whether to create a new one, import one, export the current one, or delete the current one. In Step 2, select metrics from the left menu to add them to the metric package, whose contents are shown in the list on the right. You can also search for metrics to add to the package using the Quick Add box. When you are done, click ‘Save’ in Step 3 and your metric package will be added to the Fundamentals menu and the metric package will be charted below the main chart. Note that Metric Packages apply only to the main ticker in the chart (the one in the chart’s main search box), as shown below.